A friend wrote and asked me about our process on this piece. First my friend and I immersed ourselves in research about the history and pre-history of this little slackwater bayou we both used to live near. Then we got together every few weeks and began brainstorming and sketching layouts. We also started carving eraser blocks of early flora and fauna from an 18th century book we managed to find about this very bayou! Eventually I sawed up a large piece of birch plywood for the background print. We spent a couple of afternoons printing the sawn block. Then we would sit together and work side by side on two of the proofs using our collection of stamps and dome water soluble crayons and watercolors. We’re still at that stage, going very slowly on our two proofs. Here’s mine propped up still in process in my kitchen. Huddled in a corner of our porch this afternoon this robin holding perfectly still. I always thought an alpaca was a kind of sheep. An icelandic sheep on the left and a sheep being shorn on the right! In a warmer light the callas have a maple leaf red glow. A new bloom is just unfurling. In Western Australia calla lilies have been classified as noxious invasive weeds. They are, on the other hand, the national flower of the island nation of St. Helena, where the native people are informally called Saints. These blooms and leaves seem to collect moisture from the very humid air and drip the water down so that they are self-watering. Can this be correct? 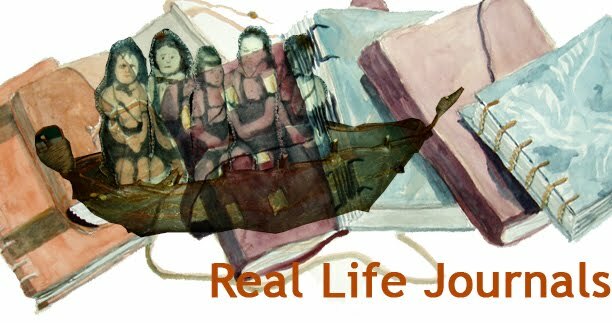 Real Life Journals is about designing, building, and using journals that help keep your sometimes wobbly little boat afloat. I see this blog as a chance to expand on, question, and make corrections to my recent book of the same title.